AAPOD page link 28/Dec/2011: Each day a different image of our fascinating universe is featured as Amateur Astronomy Picture of Day. Zhangwei Jin(Ningbo, Zhejiang, China) and Xing Gao (Urumqi, Xinjiang, China), report the discovery of a possible supernova (mag approximately 14.2) on a 60-s survey image (limiting mag about 19.5) taken by Xing Gao in Xingming Observation Sky Survey(C42) around Apr. 26.82344 UT,2011. 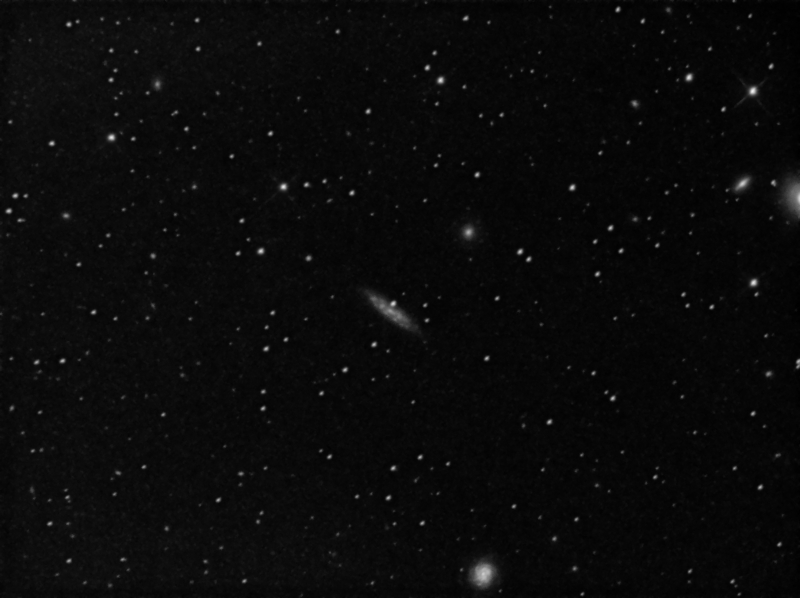 using a unfilled CCD ( + Celestron C14 Schmidt-Cassegrain telescope D=350-mm @f/6.9 ). The new object approximately located at R.A. = 11h 55m 45s.56 Decl. = +55°19'33".8 (equinox 2000.0). Which is about 5.3" east and 19.1" north of the center of the galaxy NGC 3972. Nothing is visible at this position on archival images taken on Apr. 10 (limiting mag 19.5) and Apr. 08 (limiting mag 19.5) or on the DSS from May 07,1991 (limiting mag about 19.5). This picture was taken in the presence of bright moon, thus not very deep and noise free. In memoriam of Mario Ruiz, my very first astronomy teacher and forever friend. Dedicado a la memoria de Mario Ruiz, mi primer maestro de astronomía y amigo para siempre. There was a focuser problem, thus image is not completly sharp. Also guiding was far from perfect. Image taken in the presence of moon light.